The Conservatory Garden in the northern portion of Central Park is the park’s most formal garden space. The Conservatory Garden is six acres of formal gardens planted in three styles – Italian, French, and English. Each style is represented in a different section of the garden. The space is filled with beautiful garden beds, water features, and statuary. Benches provide places to relax and enjoy the views. The Conservatory Garden is designated as a “Quiet Zone” and is a perfect place to escape the bustle of New York City streets. Public restrooms are available near the Conservatory Garden Center Fountain. The gardens are at their most colorful in the spring, when the crabapple trees are blooming and the beds are full of tulips. 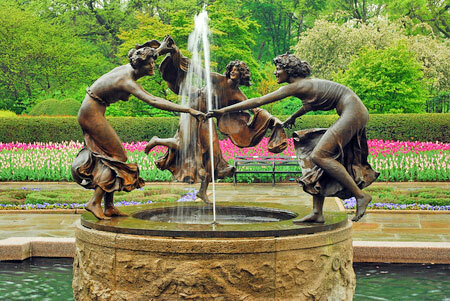 The Conservatory Garden is located on the eastern side of Central Park, between 104th and 106th Streets. The closest park entrances are the Fifth Avenue entrances at 105th Street and 106th Street. Nearby attractions include the Museum of the City of New York City and El Museo Del Barrio, both located on Fifth Avenue between 103rd and 105th Streets.